Lecture by SVETLANA PANKOVA on one of the truly unique collections of The State Hermitage Museum! Something you will never see anywhere else but in the Hermitage - the unique Siberian collections, with material from burials dating from the 4th to 3rd centuries BCE!!! Svetlana Pankova is a Senior Research Fellow and Curator of the Siberian Collections at The State Hermitage Museum and is currently making a detailed study and re-evaluation of the Siberian burials of the 4th to 3rd centuries BCE. She will speak about her research and the latest findings. In 1902 a shepherd accidentally fell into a tomb at a place called Oglakhty in the present-day Khakasia region of southern Siberia. Excavations quickly followed and revealed a series of subterranean tombs built like small log-cabins. Some contained spectacularly preserved organic materials, including fur coats, wooden bowls, Chinese silks and spectacular painted plaster masks adhering to the faces of the mummified dead. Next to the bodies were life-size mannequins made from grass, wrapped in leather and dressed in human clothes. The dating of the cemetery has been controversial, ranging from the first century BCE onwards, and the interpretation of the finds has also given rise to much discussion. Masterpiece London is the leading international Fair for art and design, from antiquity to the present day. 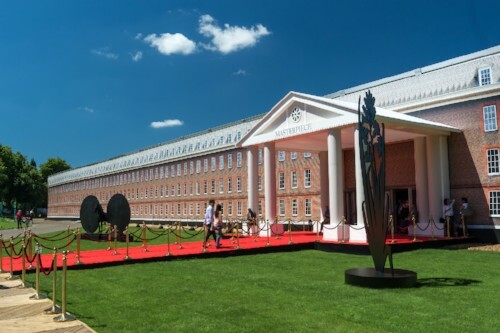 Over the past seven years it has established itself as 'the' event for viewing and buying the finest works of art. I have obtained a limited number of tickets for the Preview Day, 27th June - please let me know if you would like to receive one - 1 ticket admits two people. The Hermitage Foundation UK Friends were invited to view this exhibition on the preview day, 24th May from 16.30 to 17.30, when Marina Shtager conducted a tour of the works of art on display.